While having coffee with my friend Bob a few weeks ago, he mentioned somewhat offhandedly that his cousin had “just written a book on Kurt Vonnegut.” Say what?! (Somehow I avoided a spit-take of my hazelnut coffee.) 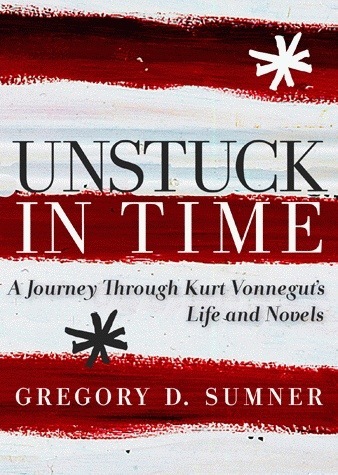 It turns out that author Greg Sumner, a Professor of History at University of Detroit Mercy had written the biography, “Unstuck in Time,” subtitled “A Journey Through Kurt Vonnegut’s Life and Novels.” Yes, there was little doubt I would read this book. 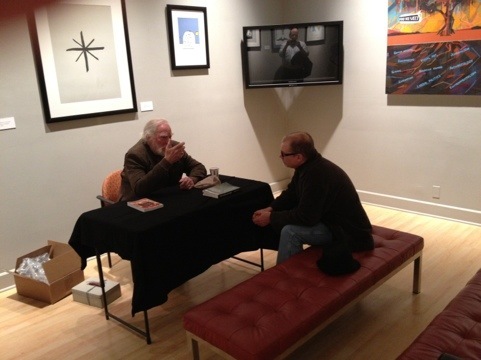 A few days later, I learned that the author would be giving a talk and book-signing at the Carmel Public Library. Though inconveniently scheduled in the middle of the work day (I sometimes wonder if those in the literary world think that the only people who read books are retired…) at 10 a.m. I made the sacrifice of going into work early and using my “lunch” hour to drive up and attend. I’m so glad I did. Author Sumner is an Indianapolis area native and graduate of Carmel High School. He shared many gems and quotations from his book and encouraged those in the audience who had met or known Vonnegut (and there were several) to share their stories as well. He noted that Vonnegut was popular amongst the younger generation as well, and “called on” a young man (who was 19) in the audience, asking him how he came to become a Vonnegut fan, etc. 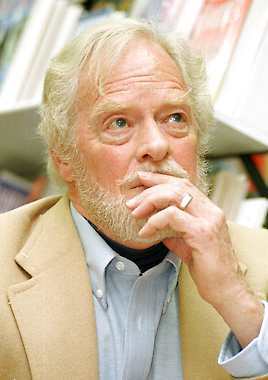 Later, Sumner also mentioned that some fans had even tattooed key phrases or quotations of Vonnegut’s on their bodies. The 19-year old, almost as if on queue, rolled up his left sleeve to reveal a “So it goes” tattoo. Nice. Several of my colleagues from the Kurt Vonnegut Memorial Library Book Club were in attendance as well, and when I excused myself “early” (but not before getting a signed copy of the book) one jokingly mentioned, “Oh, I forgot some of us still have to work for a living.” Yes, that is darned inconvenient. So, back to work and to dealing with the stress of a month-end close process, I struggled dutifully on until exactly 5 p.m., when I dashed out the door and sped off to the east side of town. My final destination was actually downtown at the KVML, which has a “First Friday” program at 6 p.m. each month, usually featuring a guest speaker or author. Since this month’s guest was best selling Indiana author, James Alexander Thom, I had invited my Mom to go with me as she has read practically all of his books. After gathering Mom up, we made it downtown with time to spare (I’m still not sure how I did his, with traffic the way it is at rush hour). The program was a little late getting started anyway, so we had some time to browse the library, which my Mom hadn’t yet seen. Anyway, a small crowd of locals (and Sumner from the morning event) were delighted by Thom’s tales about his writing and about his association with Vonnegut, with whom he was friends – but “not close friends,” as he was careful to point out – even though he related that they talked on the phone often until near Vonnegut’s death in 2007. 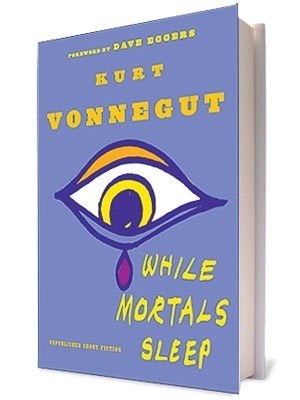 This is the selection of the Kurt Vonnegut Memorial Library Book Club for March. I look forward to reading it. Well, I’ve actually already started, having read the first of the sixteen previously unpublished short stories in this book, just released in January of 2011. My only fear is that they were unpublished for a reason, but that fear is tempered by my rationalization that Vonnegut’s “rejects” are likely better than almost everyone else’s polished final product. We’ll see. 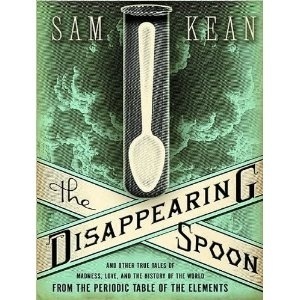 This one is kind of “required” as it is part of my main 2012 reading project of “one author biography per month.” THus far, I’ve finished Hawthorne and, almost, Kerouac, and since I just went to a talk and book signing by this author on Friday, it’s a natural pick for the next one. On loan from a co-worker (for a few months now), I need to get around to reading this one so I can return it (Ben Franklin would be ashamed of me!). 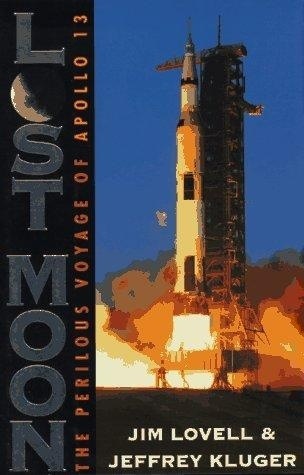 Everyone knows the story of Apollo 13 (especially if you’ve seen the great film dramatization with Tom Hanks), but I’d like to read Lovell’s own thoughts on it as well. My one story per week project rolls on (see my reading selections). I also would like to read something else by author James Alexander Thom, (pictured below & a favorite author of my Mom’s) who I had the pleasure of meeting in person last week. Perhaps his From Sea to Shining Sea would be the logical choice since I just read his other Lewis and Clark Expedition book (Sign Talker) last month. Well I guess that’s about it (& isn’t that enough?!) – but what about you? What are your reading plans for March?